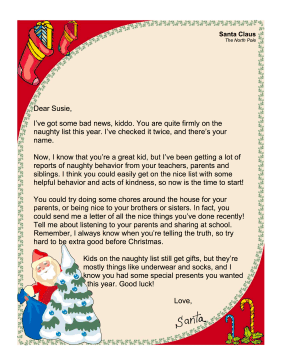 In this free, printable Santa Claus letter, Santa warns the child that they are on the naughty list and offers suggestions about how to get onto the nice list before Christmas. I've got some bad news, kiddo. You are quite firmly on the naughty list this year. I've checked it twice, and there's your name. Now, I know that you're a great kid, but I've been getting a lot of reports of naughty behavior from your teachers, parents and siblings. I think you could easily get on the nice list with some helpful behavior and acts of kindness, so now is the time to start! You could try doing some chores around the house for your parents, or being nice to your brothers or sisters. In fact, you could send me a letter of all the nice things you've done recently! Tell me about listening to your parents and sharing at school. Remember, I always know when you're telling the truth, so try hard to be extra good before Christmas. Kids on the naughty list still get gifts, but they're mostly things like underwear and socks, and I know you had some special presents you wanted this year. Good luck!